On January 24th, 2012 I returned to the quiet community of Grandois or St. Juliens (currently used interchangeably). 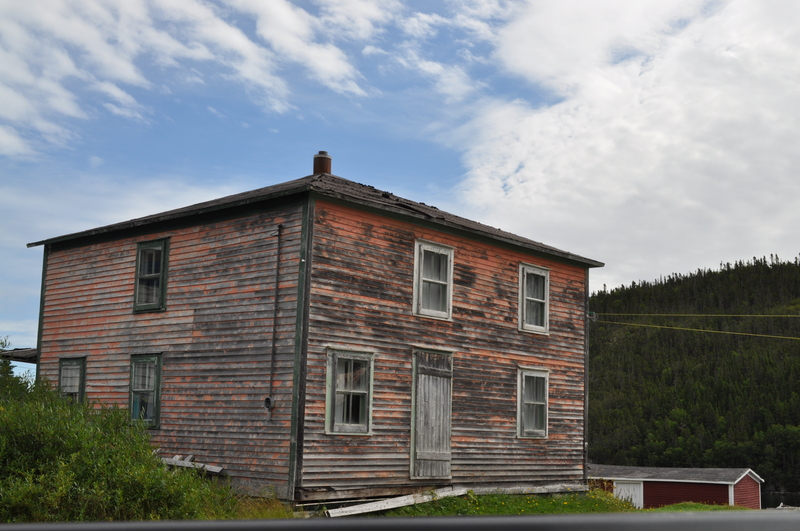 In 1980 this community was connected via road to neighbouring Croque and to Main Brook – which remains today a 30 km gravel road craving some crush stone. Although, the blanket of snow cushioned the numerous potholes. The view from the harbour is worth the ride. The tiny islands and hamlets showcase the remnants of re-settlement. During the summer a boat tour can be arranged to see the Ghost Towns that remain on these islands. On this chilly day in January, one could see the chimneys burning, heating the homes. 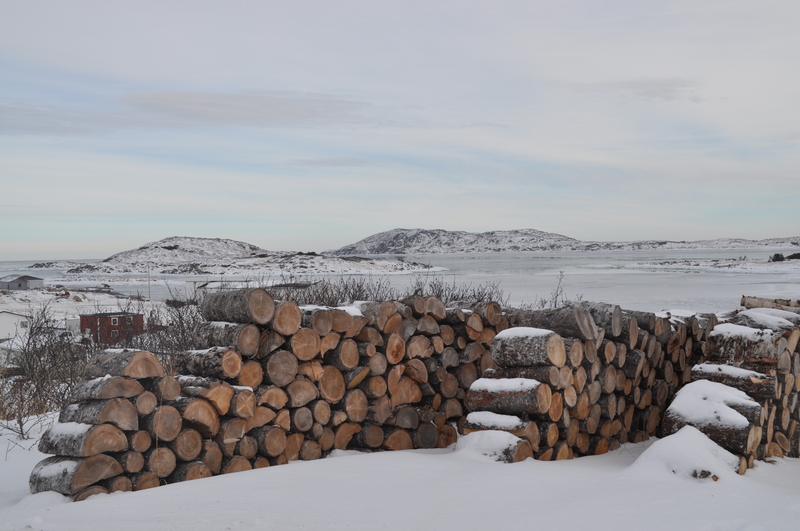 I stopped and took the photo of the tiers of firewood on the hill. A view of the community can be seen from here. 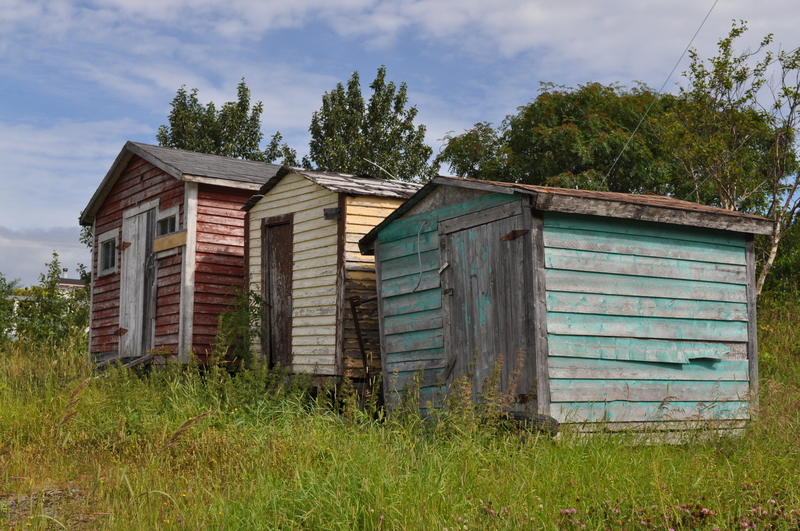 There are very few homes, of which many are currently vacant. 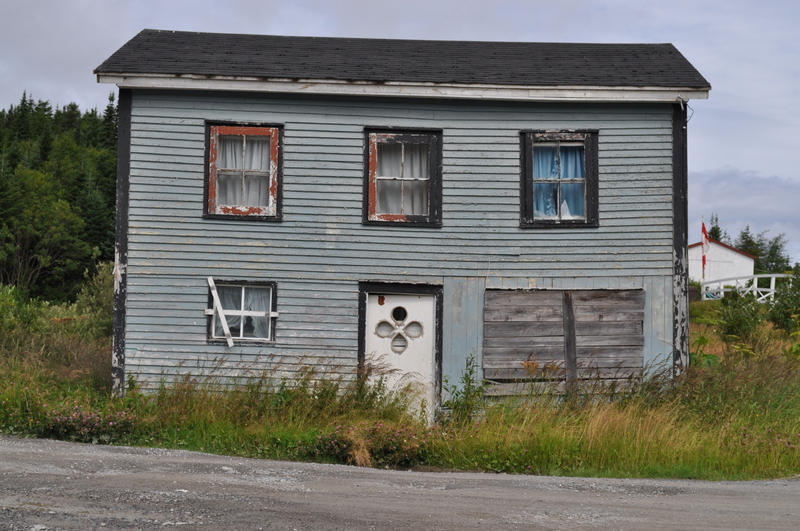 The closure of the cod fishery in 1992 – left the community, like many other outports struggling to survive. The community of Grandois at its peak had 135 people. Today, those numbers have dropped drastically into the low double digits. Despite the population decline, limited water supply and lack of community services – the residents are extremely hospitable and a pleasure to talk about the past, present and future. We must savour the beauty this place offers the people who continue to call this place home. There is a wealth of history in this community on the French Shore. It may just be the next place you want to visit. Does Anyone Know the Story behind this Snowmobile? A miniature replica of an old snowmobile was displayed on the yard in the Town of St. Lunaire-Griquet while I was searching for the Petermann Ice Island! I passed by this item, but was told to take a snap. Does anyone know the history behind this piece of art? 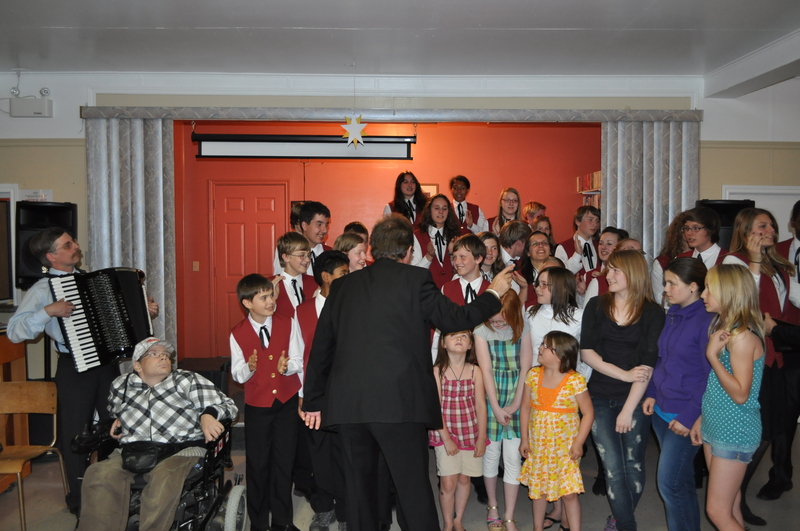 The Saltwater Joys – Tour of Newfoundland & Labrador presented by The Munich Youth Choir set the stage that drew a large audience at the Bird Cove Community Centre on Tuesday, August 2, 2011 at 7:00 PM. It was wonderful to see nearly 200 people come out for this event that had limited marketing in the region. They opened the event to all and accepted donations. It was nice to see the inclusiveness and variety of all age groups from a few years to the mid-eighties. I was fortunate to be able to sit in the audience. I have attended operas, musicals, theatres and other special performances in Europe; however, this was my first by youth. It was a very empowering experience! A production that promotes the exchange and share of culture. We were greeted with German music, British, English, Japanese, Australian, African, Classical, Popular Culture and even tunes from Newfoundland & Labrador. I was captivated by their rendition of “Yesterday” by the Beatles. For me this was completely unexpected. I really did not know the aptitude of this group and their talents. I was pleasantly surprised. They utilized different instruments, including a bone drum, tambourine and keyboard accordian. Celebrate Life made me smile, enough that I purchase their “Folk CD” and have played it in my car to and from work for more than 1 hour. The Sister Act tunes really were upbeat! It was also a first hearing a song recited in Japanese. Although, I truly enjoyed hearing the Newfoundland Tunes of “Danny Boy“, “I’se da By’s” and one of my favourites “Saltwater Joys”. They were impressive! It reminded me of being at the Opera House in Prague, Czech Republic watching a Grand Performance, when you realize that you are in Rural Newfoundland & Labrador at the local community centre. The World has come to us, to share with us their talents and we had the opportunity to share with this group from Munich the rural lifestyle. I have been on an exchange, lived, studies and travelled Europe visiting nearly 30 different countries and there is much value in meeting, learning and sharing ideas with others. The Munich Youth Choir was given the opportunity to meet and hang out with locals, travel the peninsula, visit Icebergs and even meet Rose. Rose is a local resident, well – Crinkle Cove, I think? She provided some light hearted humour while the band played traditional Newfoundland & Labrador music including the “ugly stick”. The group easily broke into dance with the group. There was much positive energy, harmony and happiness in the room with each others company. 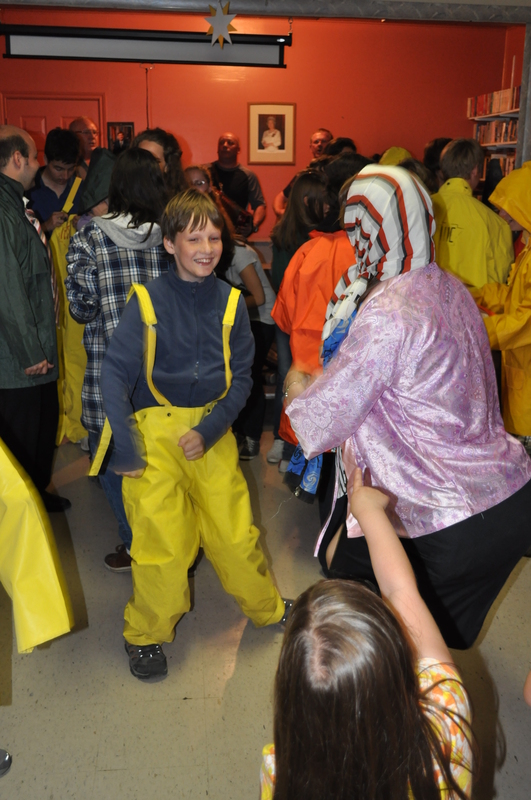 Rose lead the way to provide a re-vised version of the Screech-in, making each visitor an honourary Newfoundlander by dressing, dancing, eating, talking and drinking Purity Syrup and kissing a cod fish. After 3 hours at the center, I was deeply rewarded for contributing my time and making a donation. In turn was exposed to music, art and culture from a very talented group of individuals. I had taken away many photos, a couple of cds and the cherished memories of being there for something wonderful. Communities came together, people were happy and we have an opportunity for more growth. Rural Newfoundland & Labrador is a good venue beyond the large urban centres for culturally significant events and entertainment. 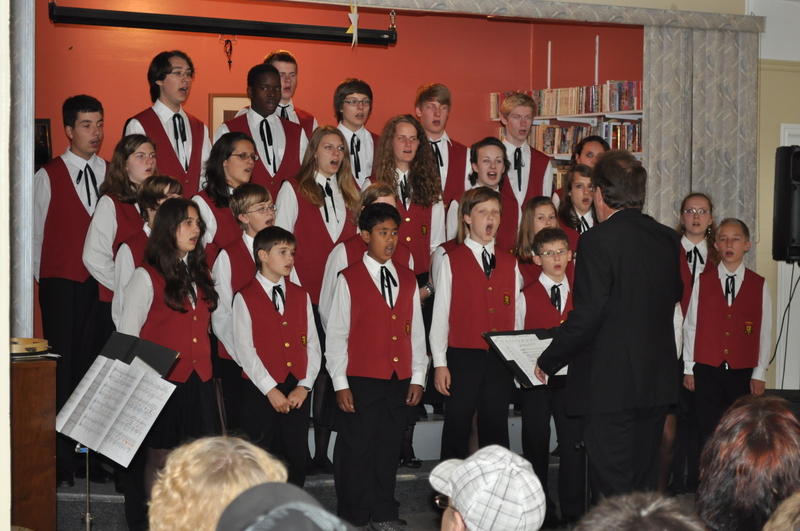 A special thank you to the Munich Youth Choir, organizers, sponsors and local groups such as the Big Droke Foundation. St. Barbe Development Association, Going Healthy Program – Bird Cove and the Town of Bird Cove. For those of you that missed the performance, you can drop by sometime for a cup of tea from the Dark Tickle Company and listen to the music. 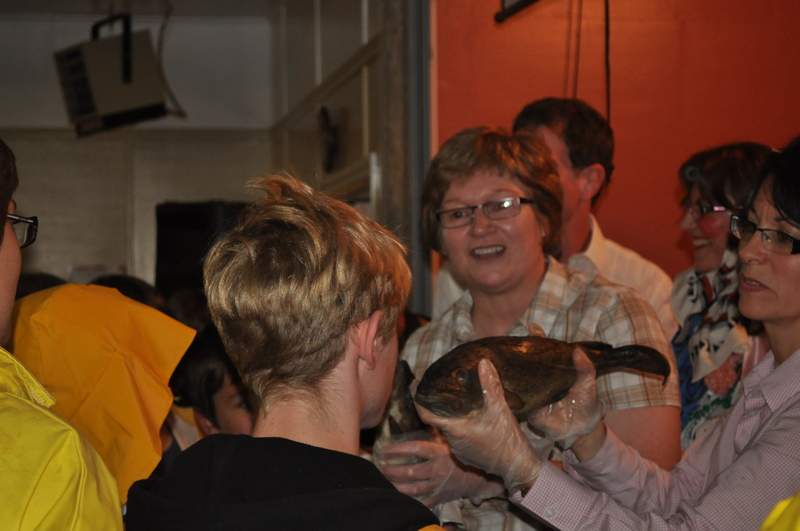 There is opportuntiy for Rural Newfoundland & Labrador to exchange talents, hosting a multitude of learning vacations. 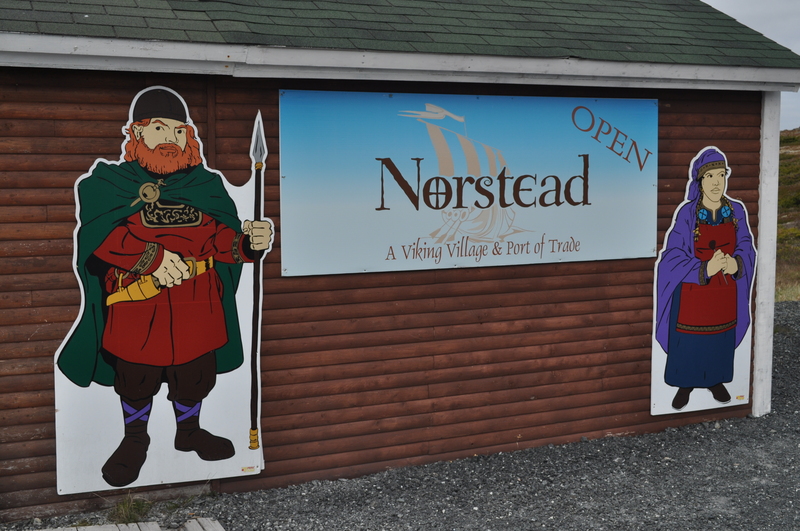 Let’s rewind to July 28, 2000 – More than 17,000 people were on site during the unveiling of Norstead – A Viking Village & Port of Trade (www.norstead.com) as they celebrated 1,000 years since the Vikings were the first Europeans to re-discover North America. The Province did a tremendous job marketing this summer festival. Can you imagine the excitement on site for this new addition – an open air museum; one which provides a unique approach to education and culture, where one can gain an enriched understanding of Norse life. More than 28,000 visitors trekked through this site during the first season alone. I have to extend a big thank-you to the interpreters and all who work at Norstead – this non-profit just 2 KM from L’Anse Aux Meadows (UNESCO Site). Some have been on-site, showing tremendous dedication to the organization for the past 11 years. It is a pleasure to walk through the gift shop, which has an array of local product – Dark Tickle’s Teas, Jams, Sauces and Syrups; Handmade Soap, Handmade Jewellery, Norse Swords, Norse Game – 9 Man Mills, Postcards, Local Art, Pottery, Knitted Items and more. The employees make products on-site and also during the off-season. There is a wealth of knowledge from the employees and they are quite willing to share with you – creating a warm and inviting learning experience. You have the ability to try your hand at living like a Viking. 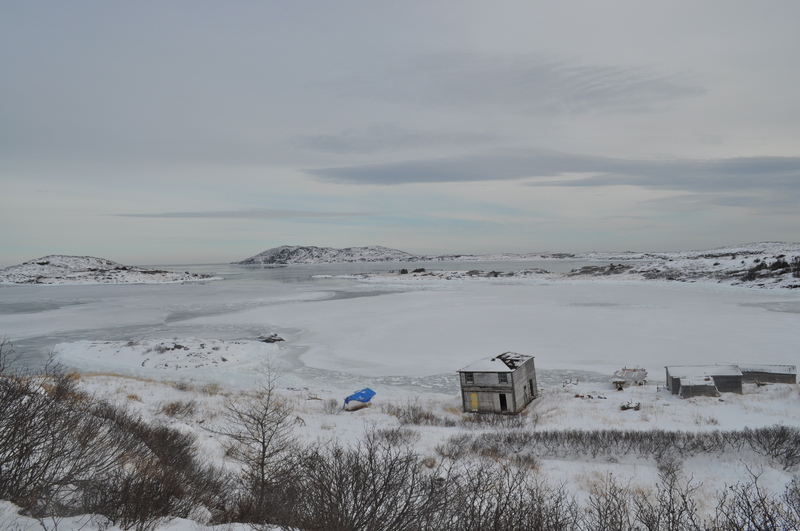 There is much opportunity to expand on this already wonderful gem on the Great Northern Peninsula. I see much potential to work with regional partners, develop further products, expand into Learning Vacations – live like a Viking (day, weekend or week-long stopovers), workshops and other activities. The future is bright for this not-for-profit entity. It has added much value to our Rural Economy and also the travel experience of those who are fortunate enough to take the time to visit. Norstead is a wonder we have, it is possible because f the wonderful people who show up and do their part every day. For that, I thank you.